Spacious commercial spaces with custom build options. State of the art infrastructures. Smart building wired with fiber optics. Only minutes away from Bradley International Airport. Quality design and detailed environments that meet the high standards set for a community featured on the National Register of Historic Places. Easy access to two major interstates, and only two hours from Boston and New York. Breathtaking views of the Connecticut River and downtown Hartford. A provincial escape in an urban setting with Colt Park a short walk away. Modern amenities combined with historic character and architecture. 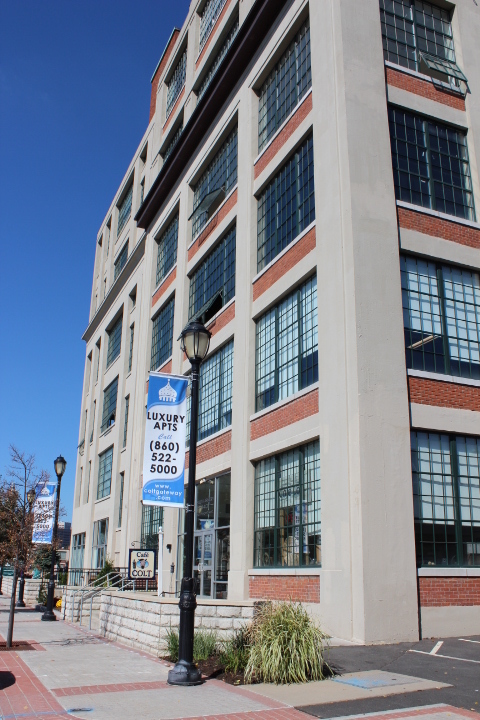 The premier loft living spaces in Hartford. River views, courtyard views, city skyline or panoramic views. Colt Gateway luxury apartments and live-work space, Hartford, CT. For more information about any of our leasing or renting options, including our office space for rent, please call or email us today.